racing, the Aintree Grand National. will no doubt once again draw in huge crowds on course as well as millions watching on their TVs at home. Last year the Gold Cup Day alone attracted a sell out crowd of over 70,000 and a total over all Festival record attendance of 262,637. Native River won the Gold Cup itself, after a stunning two year period which saw the thoroughbred also win the Hennessy Gold Cup, Welsh Grand National and Denman Chase. He's currently second favourite to win the 2019 race, so the fairytale hasn't quite ended yet! Other races to look out for include the Queen Mothers Champion Chase, which is held on Ladies Day (Altior will be looking to retain his title) and the Stayers' Hurdle. The main races will all be shown on ITV1 so there is no excuse for not tuning in! Just three weeks after being spoilt by the Cheltenham Festival, we have the one and only Grand National. If there's one race everyone knows about, regardless of their level of interest in the sport of horse racing it's the National. The main race itself is part of a three day Festival of racing that begins on 4th April, is followed by Ladies day on the 5th, with the main event taking place on the 6th of the month. The 2019 Grand National is bound to rival the excitement that was the 2018 race, where 10-1 Tiger Roll, ridden by Davy Russell, beat out Pleasant Company in a photo-finish. Astonishingly that was the 171st time the race had been held, which just goes to show how steeped in history the race is. Thankfully all 38 horses finished in good health too. 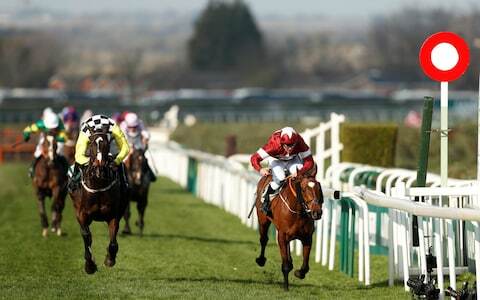 The 2019 Grand National is again sponsored by Randox Health and sees Tiger Roll out to defend his title. This adds an exciting dynamic to the race as no horse has had back to back wins since Red Rum in the 1970s. It would be the cherry on the cake for the Gordon Elliot trained thoroughbred, as he's already amassed prize money of over £800,000. It's early days in the Grand National betting odds, with Tiger Rolls and his main rivals Elegant Escape, Vintage Clouds, Warriors Tale and Rock the Kasbah all coming in at around the 20-1 mark. The 2019 Grand National certainly has the makings of a race you can't afford to miss, and so the eyes of the nation will no doubt be watching yet more Grand National history unfold. The Grand National starts at 5:15pm, April 6th on ITV1. Don't miss it!